Moreso than usual, in this tasting the group view of the best wines differed from mine: this article is a personal account, therefore. The group view is indicated in the wine descriptions. From the left, my top six wines: 1977 Graham's, richer, sweeter and riper than the others, but fewer subtleties (two half-bottles), 18.5 +; 1977 Taylor's, supremely subtle and delicate, reminders of Pauillac, 19 +; 1963 Fonseca's, wonderful bouquet, not quite the total harmony of the 1963 Dow's on palate, 19 +; 1977 Dow's, piquant, spicy, complex, approaching maturity, 19 +; 1977 Fonseca's, nearly as big as the Grahams's, but with extraordinary piquancy, complexity, richness and length, still a young wine, 19.5; 1963 Dow's, not quite as powerful as the 1977 Fonseca, but an understated complexity, harmony, flavour and length, combined with a silky finish, made tasting this wine an absolutely benchmark experience, 19.5. These six wines, plus the 1975 Delaforce, illustrated just why vintage port holds such a special place in the hearts of keen wine-people. This Library Tasting (at Regional Wines & Spirits, Wellington) produced a most unusual anticipatory delight among participants, which seemed to intensify as the wines were actually tasted � a joy to experience. Few had ever tasted 1963 vintage port before. As discussion emerged during the evening, the fact became apparent that indeed, for most people, it is rare to even have two vintage port wines open alongside each other, for evaluation. Settling down into the wines, the first impression was of how beautiful the colours were, nearly all them limpid and glowing, ruby and garnet, variously mature / old pinot noir colour in weight. Surprisingly, it was not at all apparent which were the two 1963 wines. And then when you started to smell them, the sheer exhilaration in several of the bouquets, so wonderfully fresh, lifted (with the higher alcohol of the port wine-style) and enticing / almost aromatic, saliva-inducing, all added to the pleasure. With the youngest of the wines 41 years old, and the oldest 55, simple berry and fruit analogies seemed woefully inadequate: for the best of them, here was the magic, the alchemy, of age, given exceptional fruit and good winemaking to start with. Even the least of the Portuguese wines, the 1975, which Broadbent is almost dismissive of, provided a surprisingly fragrant, balanced and harmonious introduction to the set of 10. On its own, it would give much pleasure. But yes, as soon as you tasted any 1977 alongside it, the latter were much richer indeed. And at the other extreme, the idea of adding an Australian vintage port style of comparable age to the blind tasting proved ill-conceived. As to preparations for the tasting, if these wines are to be presented in optimal condition, bright and clear, they must be stood-up several weeks before the tasting, to allow the flakey tissue-like deposits to pack down. Extracting the corks without stirring up the deposits is a fraught process. The volume of crusted / condensed material in some bottles was staggering � a full egg-cup in one. And not just fines: lumps and aggregations so big the bottle had to be shaken / jolted (for one), to get them out. The richness / sugar-free dry extract of the better vintage port wines at bottling must be off-the-scale. In preparing the notes for this tasting, �we have to bear in mind transatlantic differences in the approach to wine. �As with red wines, the American taste in vintage port tends to the larger, riper, �and sweeter. 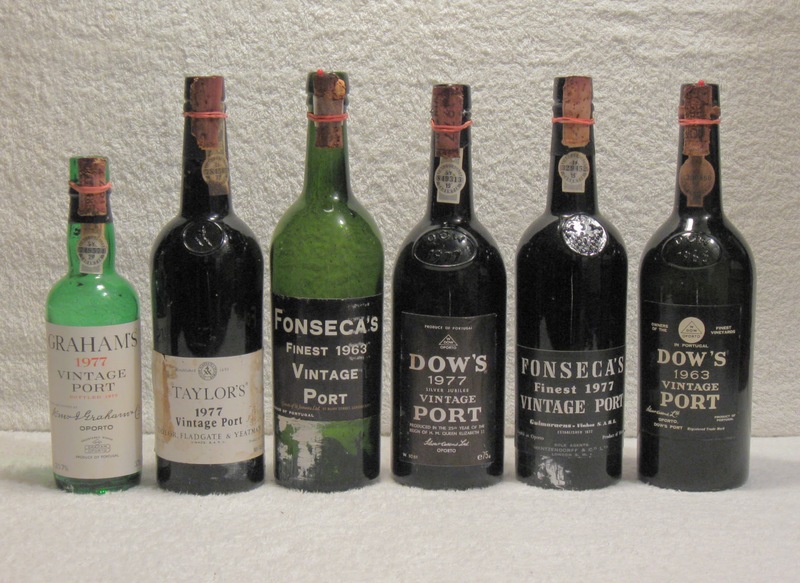 Which years constitute �classic� vintage port years will therefore differ, �either side of the Atlantic. I have preferred to use the European approach. I have therefore made extensive use of the information on the website of The Vintage Port Shop, ��Fordingbridge, Hampshire. �They achieve a standard of excellence we can only dream about, �and envy, in New Zealand. All their sales staff have WSET qualifications. �The shop maintains a cellar stock of over 10,000 bottles of port. Their website has at least a little information for every single port vintage from 1912 to the present day. For 1977 The Vintage Port Shop rates the year a five star vintage, �one of 12 only since 1900: 1917, 1927 1945, �1948, 1955, 1960, 1963, 1966, 1970, 1977, 1994, �2011. They describe the wines thus: The 1977 port vintage was a classic Port vintage that was declared by all the major port houses. Even after more than thirty years, the ports are only just becoming approachable. They will last for many more decades. The port wines are concentrated, complex, well structured and balanced. Marked by strong tannins, these wines have great finesse and staying power. �In 1992, Richard Mayson (author of �Port and the Douro�) writing in Decanter described the 1977s as: � quintessential Vintage Port � the best 1977s are as near to perfection as the most fastidious Port drinker will ever find. Since then the view has grown that 1977 may fall fractionally short of the all-time great years such as 1963. The Vintage Port Shop [ at the point of writing ] has 18 individual 1977 vintage ports in stock, �the prices ranging from �85 to �375.00 per bottle. Note we have their three most expensive in our tasting. For 1963, �The Vintage Port Shop describes the vintage in these terms: �1963 vintage ports are the benchmark against which others are compared. The Vintage is considered to be legendary! The combination of a near-perfect growing season and temperate weather during the harvest made for a benchmark vintage. Nearly all the shippers produced supremely balanced well-structured wines ... 1963 vintage ports never fail to impress with their essential three components of fruit, tannin and elegance. [They] Almost always appear to be younger than they really are. The Symington family (Dow, Graham, Warre etc) say of the 1963s: a monumental vintage of legendary proportions that needs no introduction. One of the 20th Century�s finest. A vintage Port against which all others are judged. The Vintage Port Shop has 22 individual 1963 vintage ports in stock, �with prices ranging from �130 to �325 for regular vintage ports, �and �4,900 for Quinta do Noval�s very rare Nacional. Note they rate the two in our tasting as: standing out amongst a uniformly excellent field. The chances of being able to buy any 1963 or 1977 vintage (Portuguese) port in New Zealand are vanishingly rare. �The opportunity to taste six 1977 wines, and two 1963, including most of the famous names, is therefore rare beyond description. Both years come into the category of cold preceding winters and modest springs / early summers, followed by marvellous Indian summers, leading to small grapes and thick skins, with good tannins and colour. September 1977 was unusually warm. Broadbent (2003) considers both years as in the �classic mould�. He describes 1963 as: a large quantity � of well-constituted, elegant wines *****; and 1977 as: Generally, these are fairly deep, consistently good quality wines *****. He notes that Martinez, Noval and Cockburn did not declare the 1977s: a decision they later regretted. Up till about 1990, foot-treading of grapes was still commonplace. Since then, the scarcity and cost of labour has made the search for mechanised ways of crushing the grapes and extracting the essence of them more important. However a number of houses still use foot-treading for the all-important (but only 1 � 2% of total port production) vintage ports. Our 1977s are perhaps all foot-trodden wines, the 1963s certainly so. The reason is the enhanced gentleness of the foot approach, with no breaking of pips and release of harsh tannins. Once the fermenting wine has reached 6� � 7� Beaumé ( about 90 � 100 g/L sugar), with about 6 � 8� of alcohol, it is run off, and blended with about 25% by volume of 77� grape �brandy� � more accurately grape spirit. The quality of the �brandy� is critical to the finesse of the ultimate port. The wines are kept in barrel for a relatively short period, and must be bottled within 2 years of vintage. Most are bottled after about 18 months, with about 20% alcohol by volume. Since 1973 all vintage port has been bottled in Portugal. Sweetness levels vary, but around 100 g/L is typical. As the premium wine of the district, most Vintage Ports are blends from several vineyards (quintas). Additionally, some firms have specialised in producing individual vineyard wines, particularly where one place has excelled in an otherwise non-vintage year. Famous examples include Taylor�s Quinta de Vargellas, Offley�s Boa Vista, and Dow�s Quinta de Bomfim, as well as Quinta do Noval Nacional. Touriga Nacional: the premier vintage port grape, but not the most widely-planted: deeply coloured, intensely flavoured, low yields, small berries, very tannic and aromatic juice. Provides body, depth and intensity, plus massive mouthfilling tannins. Wines dominated by touriga nacional include Noval and Taylor, and are long-lived. The grape has some sensory similarities to cabernet sauvignon. Touriga Franca = Touriga Francesa: the most widely-planted variety, reliable and well-regarded, often the base for vintage ports. Not the same as Tinta Francisca, nor French. Favoured for perfumed aroma, intense fruit, and full-bodied. Sometimes floral. Tinta Roriz: the Tempranillo of Spain (= Aragonez), the second most-planted, thick skins, high sugars, low acidity, succulent and fragrant, finely-constituted, a tendency to over-produce. The good tannin structure promotes longevity, and sometimes contributes resiny notes. Tinto Cao: the least-planted of the top five, due to low yields, but reliable and tolerant of very poor soils. Produces light-coloured wines which with bottle age develop finesse, complexity, and spice. Interest in this variety is increasing. Tinta Barroca: the third most-planted, thick-skinned, sweet (sometimes too sweet), producing wines with good fruit and tannin, long-lived. Not quite as highly regarded, by some. Plus Sousao, which several houses (eg Noval) favour over Tinta Barroca. Aggregation of port houses continues. There seems to have been no loss of individuality. Noval was until 1993 Portuguese, but is now owned by the French group AXA; and Quinta do Crasto is all Portuguese, predominantly a red-wine company in the Douro. For most, the prices shown below are the current wine-searcher international averaged values, expressed in New Zealand dollars. Where available, the original purchase price is shown in the �admin� section of the review. As presented, the wines were blind, to obtain a group ranking. Identification was revealed early, so tasters could benefit from the recorded views of markedly more experienced tasters, as summarised in the handout. That information us now in the italicised �admin� section for each wine, the quotes in roman.